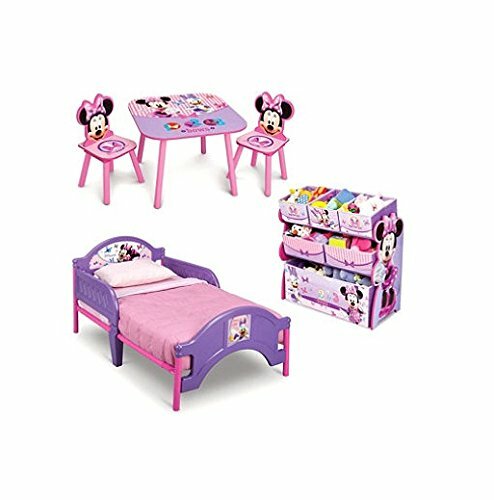 The Minnie Mouse 3-Piece Toddler Bedroom Set by Delta Children includes the Minnie Mouse Plastic Toddler Bed, the Minnie Mouse Multi-Bin Toy Organizer and the Minnie Mouse Table & Chair Set.Disney Minnie Mouse Plastic Toddler Bed:Make her space extra-special with a little help from Minnie Mouse! Boasting colorful graphics of Minnie and her BFF Daisy Duck at the headboard and footboard, this Minnie Mouse Toddler Bed from Delta Children helps your girl make the transition from crib to big kid bed thanks to the two attached guardrails and low to the ground design. Disney Minnie Mouse Multi-Bin Toy Organizer: This Minnie Mouse Multi-Bin Toy Organizer from Delta Children will keep your girl's clubhouse cute-and clean! Featuring a sturdy wood frame and six uniquely sized fabric bins there is plenty of room for toys big and small. Disney Minnie Mouse Table & Chair Set: Keep your kid's clubhouse cute with this Mickey Mouse Table and Chair Set! Featuring two chairs with die-cut backs and a coordinating table with a large surface, it's the perfect place for mini Mouseketeers to eat, play or do homework. If you have any questions about this product by Uneedum, contact us by completing and submitting the form below. If you are looking for a specif part number, please include it with your message.